San Diego is home to almost 500 wild bird species, more than any other county in the United States, with about half living in urban areas. It’s actually easy to deliberately attract birds into your yard. The San Diego Audubon Society’s Audubon at Home program encourages residents, businesses, and schools to grow drought tolerant native plants and use sustainable landscaping techniques to create a bird-friendly habitat. Think of birds as ideal pets (without the cuddling, obviously) that provide very little commitment. Just provide a little food and water and they’ll come and go without too much trouble. Leave on a vacation and they’ll still be there, without the guilt or expense of boarding. Watching for them relaxes the mind as patience is involved. Birds attract other birds, too, and they do enhance the home. Have you ever felt unhappy while watching a hummingbird hover gracefully over a flower? Probably not. The soothing sounds, graceful flight and colorful foliage all appeal to the senses. Bird enthusiasts advise that the patience sometimes required to watch for birds is calming and, therefore, good for the soul. Many take pride in maintaining lifetime bird lists of every single species that has passed through. Some bird enthusiasts say that once your first bird accessory is installed, that you’ll be hooked for a lifetime. Feeders, houses, baths and nesting boxes provide birds respite and even a place to raise their young, if that’s what your goal is. 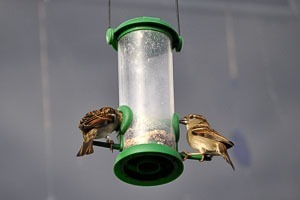 Bird Feeders: Beginning bird enthusiasts often start with a simple feeder, though the number of styles and variety can be overwhelming. Think about the type of bird you wish to attract and what kind of feed you envision using. 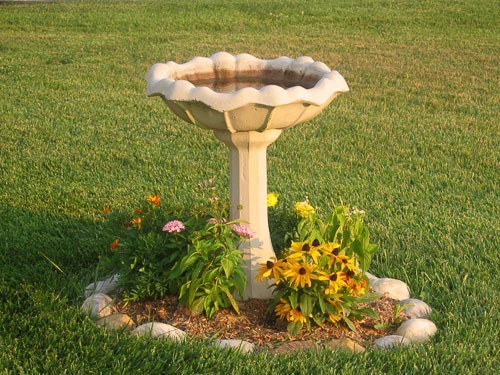 Bird Baths: Like you and I, birds need water and a place to bathe in order to survive. Believe it or not, bird baths come in non-heated and heated versions that will prevent water from freezing in colder climates. The size of bird bath you buy depends on what kind of birds you’d like to attract. Small birds are comfortable in about 1-1.5 inches of water, though a bath that is shallow on the outer rim and deeper toward the middle can potentially accommodate a variety of birds. Birds prefer the baths to be left out in open spaces near trees and shrubs, but be sure to avoid a spot where feed can drop into it. Every 2-4 days, it’s recommended that you clean out the bath with a scrub brush. Use a dab of mild detergent and rinse if it’s particularly soiled. 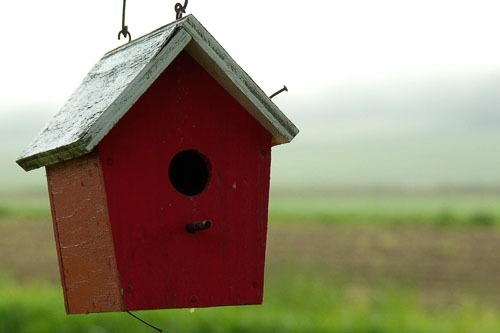 Bird Houses: Bird houses are not only decorative, they provide much needed shelter for birds during rain and a safe place to rest. Of course, different sizes of bird houses (and their entrance holes) accommodate different birds. Each house should have adequate drainage. 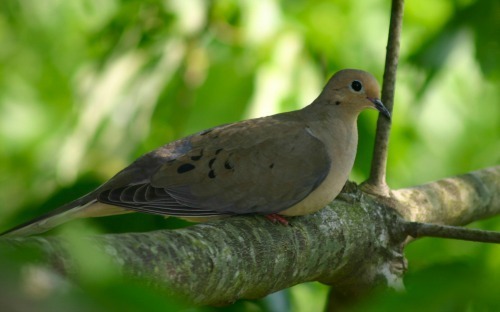 Look around your yard to determine which birds are likely to use the house. And, these houses can be fancy colonial-style houses that look like they were designed by an architect or kits to assemble yourself. They don’t have to attach to trees either as quite a few stand freely on poles. Sunflower seeds: They’re widely preferred by most of San Diego’s backyard birds. Use it in a flat feeder or tube feeder that dispenses seed as it’s eaten. 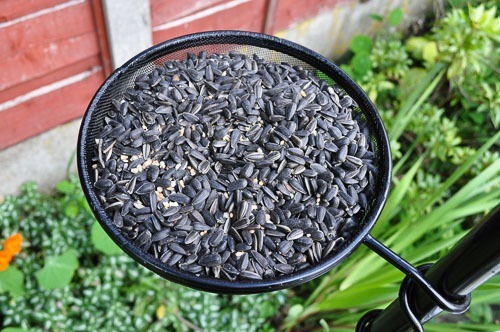 There are two types of sunflower seeds preferred by birds, the striped kind that most humans eat or the black-oiled version. The latter is most preferred. Keep in mind that birds can make a little bit of a mess when splitting open the seeds, but it’s pretty pricey to buy them deseeded. Hummingbird nectar: Microwave one part sugar to four parts water until the sugar dissolved. Don’t use any red food coloring! Pour the mixture into a hummingbird feeder but make sure to place it where ants aren’t likely to invade. Some feeders or creative birders put a small disc of water on top as both a water source for birds and a way to trap ants should they try to climb on to the feeder. Mixed seed: Appropriate for birds like doves, pigeons and other ground-dwellers, a simple plate of mixed bird seed is a recipe for easy avian happiness. Fruit: Believe it or not, fruit such as a cut up orange is enough to attract bigger birds like bluebirds, jays and woodpeckers. Tips: Bird feed also attracts animals like squirrels so you’ll need to keep this in mind when choosing where to place it. And, just like bird baths, cleaning water dishes and feeders is very important in order to keep backyard birds healthy. The San Diego Audubon Society says that landscaping with native plants, a wildlife-friendly design and healthy gardening practices enables a yard to mimic our states habitat, which naturally attracts native and migrating birds. As we’ve mentioned prior, native plants are adapted to local soil and climate while requiring less water and care than imported plants. The garden doesn’t have to be entirely native plants, but select ones with seeds, berries and nectar help sustain birds and butterflies and lay out fresh water, seed and even shelter. Birds like a diverse garden structure including trees and low shrubs with open areas mixed in. Just make sure to eliminate pesticides, avoid invasive plants and use minimal fertilizer to keep the native plants healthy while protecting wildlife. Urban lighting in coastal haze is a particular hazard for nocturnally migrating birds who may need to fly lower for visibility. The result is that they often fly into building windows and die. It’s estimated that one billion birds die like this in the United States every year. It happens residentially too, but there are a handful of measure to take if you have a perpetual problem that are suggested by the Audubon Society. Research has shown that birds will avoid windows with vertical stripes spaced 4 inches apart and horizontal stripes spaced 2 inches apart. The San Diego Audubon Society is working with the San Diego Zoo to raise awareness of the problem throughout the county. See their Save the Birds flyer for more details. What types of birds have you spotted in your yard?